Iarla Ó Lionáird shares an in depth conversation with composer Linda Buckley for Vocal Chords: In Conversation for RTÉ lyric fm as part of this multi award winning series. The full documentary was broadcast Sunday December 3rd 2017. In this 14th instalment of Vocal Chords, Iarla’s guest in this episode is the Cork born composer Linda Buckley whose work explores and uses the human voice. Linda comes from a family of 9 from the Old Head of Kinsale and grew up in a traditional music environment before studying music at UCC and Trinity College Dublin. Linda Buckley is a composer/performer based in Dublin/Kinsale who has written extensively for orchestra, and has a particular interest in merging her classical training with the worlds of post punk, folk and ambient electronica. Her work has been described as “fantastically brutal, reminiscent of the glitch music of acts such as Autechre” (Liam Cagney, Composing the Island) and “engaging with an area of experience that new music is generally shy of, which, simplified and reduced to a single word, I’d call ecstasy” (Bob Gilmore, Journal of Music). Music for theatre includes work by Enda Walsh (Bedbound) and film by Pat Collins (Living in a Coded Land) and Tadhg O’Sullivan (Solas Céad Bliain). Awards include a Fulbright scholarship to NYU and the Frankfurt Visual Music Award 2011 (Silk Chroma). Recent and upcoming collaborations include work with Mmoths, arrangements from This Mortal Coil, remixes for Augustus and John, as well as performances by the BBC Symphony Orchestra, Icebreaker, Joby Burgess, Ensemble Mise-En and Crash Ensemble. Linda also lectures on the renowned Music and Media Technologies programme at Trinity College Dublin. She is now an international artist of considerable reputation and her music has been performed by the Dresden Sinfoniker Orchestra, Crash Ensemble, Fidelio Trio, Orkest de Ereprijs, Janus Trio, Rothko Trio, University of York Javanese Gamelan, and featured at international festivals including the Bang on a Can Summer Institute of Music at MassMoCA, Gaudeamus Music Week Amsterdam and Seoul International Computer Music Festival. She is herself a fine singer and her work, like her recent show at the Kilkenny Arts Festival – Antartica in collaboration with the uilleann piper David Power, features her vocal and electronic composition. In this episode Iarla explores Linda’s work and talks about their own collaboration Ó Íochtar Mara which was performed by Crash Ensemble at the Sounds from a Safe Harbour Festival in Cork. From January 2018 Linda will take up a new post as Lecturer in Composition at the Royal Conservatoire of Scotland, in Glasgow. Vocal Chords – Iarla Ó Lionáird and Linda Buckley In Conversation. The story behind their work together. lindabuckley.org for more about Linda and her work. Glen is in conversation with fellow singer Iarla Ó Lionáird about his life and work in song in this documentary for RTÉ lyric fm as part of this multi award winning series. The full documentary was broadcast at 6pm on October 29th 2017. Glen Hansard’s vocal journey began as a young teenager busking on the streets of Dublin but it has taken him to some of the biggest arenas in the world and an academy award for best song in the film ‘Once’. That film was inspired by Glen’s own busking life and he also got to play the lead role. His film work began in ‘The Commitments’ while he was fronting his band ‘The Frames’ and since then he has worked with his idols Bob Dylan, and the late Leonard Cohen, as well as sharing a stage with international performers like Bruce Springsteen and Pearl Jam’s Eddie Vedder. Glen talks with Iarla of a life dedicated to music and shares a song ‘Didn’t He Ramble’ written after the death of his father. 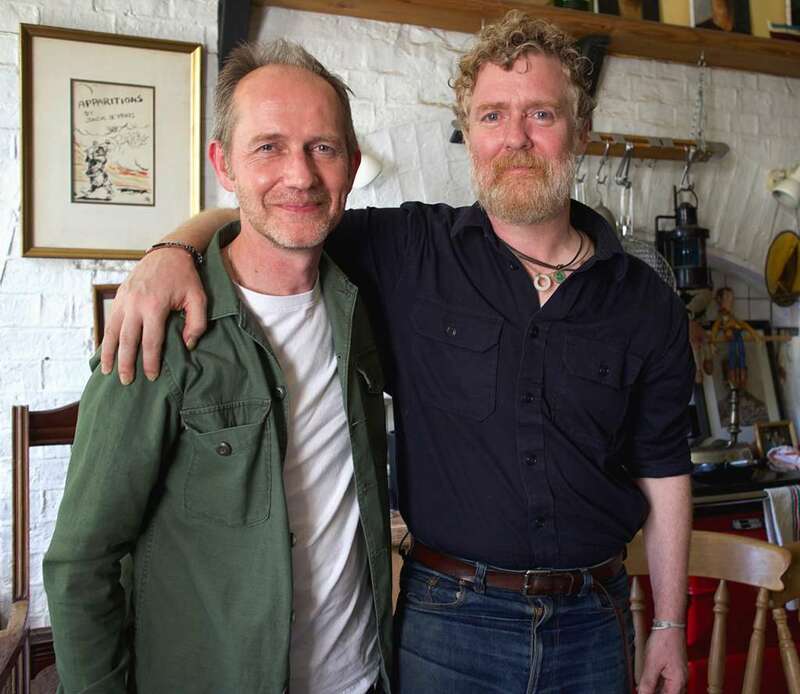 Glen Hansard in Conversation with Iarla Ó Lionáird is an Athena Media production for RTÉ made with the support of the BAI.